This patient education brochure emphasizes the benefits of dental implants as a restorative option. Patients who have lost teeth are often self-conscious of their smile but they may not realize the long-term problems of missing teeth that are not replaced. 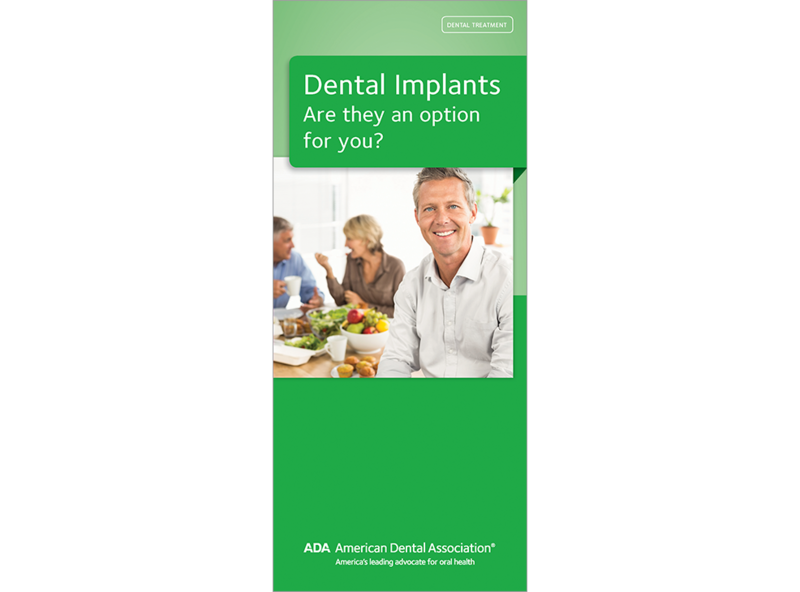 This ADA brochure explains everything they need to know about dental implants to make an informed decision. Your patients will learn the value of implants and their care within this comprehensive brochure. This brochure is an important guide for patients looking for long-lasting solutions to fill in their missing teeth. Help your patients rediscover their confidence by educating them on the value of dental implants. Order your copies of “Dental Implants: Are They an Option for You?” today! PERSONALIZED Dental Implants: Are They An Option For You?